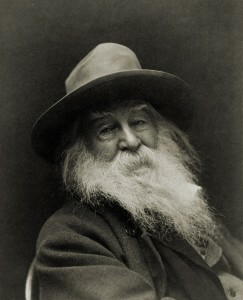 Whitman was a living legend by this point. The infirm 78-year old writer lived in Camden, New Jersey, and rarely left his home. His most notable appearance in New York the previous year had been as a lecturer at the Madison Square Theater, discussing the legacy of Abraham Lincoln to an audience which included Mark Twain and Augustus Saint-Gaudens. A poem by Whitman would have been reason alone to buy an edition of the New York Herald. And indeed, as the Herald’s ‘poet laureate’, several of his most notable works had debuted there. “Mannahatta,” for instance, debuted in the Herald on February 27 that year. Unfortunately, “The First Dandelion,” a little ode to the coming spring, ran on March 12, 1888, the worst day of the Blizzard of 1888, a day when several feet of show and deathly winds were making the American northeast a very unpleasant place to be. The poem “made its appearance at a most unfortunate time,” said the journal Illustrated American in 1892. Neither the Herald nor its readership held it against Whitman personally. Four days later, the paper published “The Wallabout Martyrs,” his tribute to those held capture aboard prison ships during the Revolutionary War. And the reputation of “The First Dandelion” was saved when it appeared in the ‘deathbed’ edition of Whitman’s Leaves of Grass, where its beauty was better appreciated.